What was one of the fastest growing ecommerce sectors in 2013? Believe it or not, it was auto parts. According to a comprehensive study by the Sydney Morning Herald, the average online automotive store saw a revenue increase of 89% - in one year. 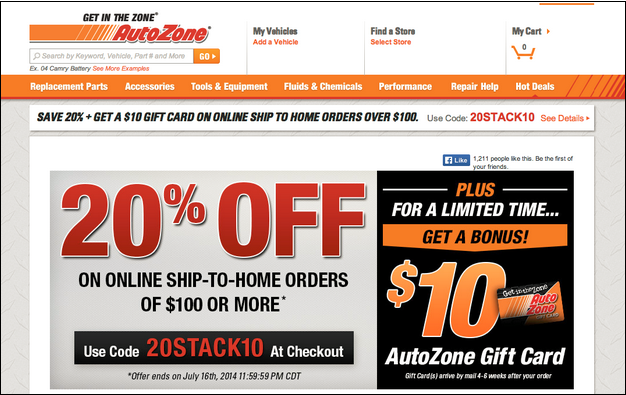 I’ve been scouring the internet, researching online auto stores. I’ve found a lot of room for online marketing improvement. With a hot market these sites could increase their profits even more by implementing an optimized sales funnel that gets results. 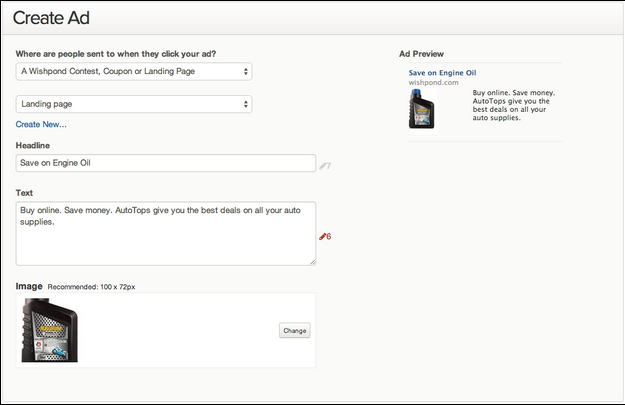 Here’s 6 steps (with a bonus tip) to increase your online auto store revenue. For an ecommerce site, having an optimized landing page for your products increases your sales. The easier you make it for a customer to buy from you, the more likely they will click your “add to shopping cart” button, and follow through to your “thank you for purchasing” page. 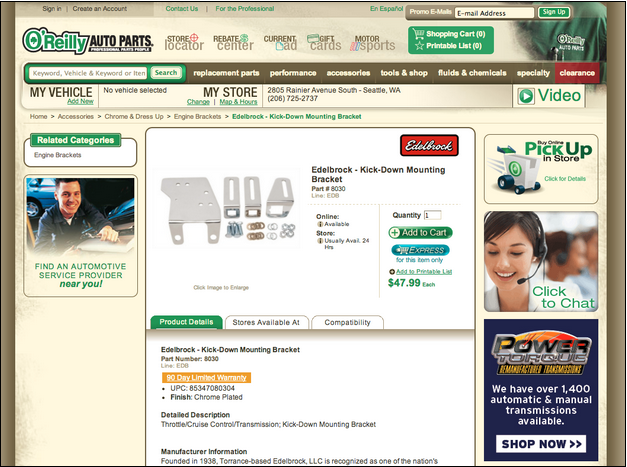 In this example, from O’Reilly Auto Parts, the product page has the basics of a good converting landing page, as outlined above. Their CTA stands out by using the same color as their logo. They have ample product details, compatibility and which stores it’s available at. They show the part, and include the part name in the headline. It includes the price too. Lower the friction on the page. There are too many distractions with the sidebar CTAs with “click to chat” and more shopping opportunities. Make a standalone product landing page without the top menu adding too many clickable options. If they need sidebar CTA’s, make them clickable images of related products to upsell. Include better directional cues to direct attention to the green “Add to cart” button. Check out more methods to increase landing page conversions. When you’re an ecommerce business, it only makes sense that you spend your advertising dollars where they work. Online advertising drives traffic directly to your site. Keywords - To show your ad when prospects search for your specific product words. Keywords are hands down the most important part of getting your ad to show to the right people, and increasing your click through rate. Location - To target by country, region or city. If you have shipping restrictions, or have pick-up only items, narrow your ad reach to get clicked by the right customers. Negative keywords - You can exclude keywords to sharpen your audience targeting. 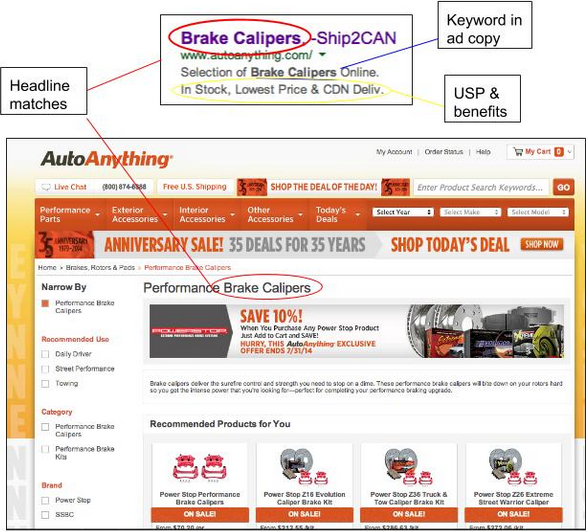 For example, if your ad is for “front brake calipers”, you can exclude searches for “rear brake calipers”. The highest converting PPC ads have a strong correlation to the destination landing page. An optimized Google Ad should include the keywords from the product landing page and have the same (or very similar) headline. Making your ad match your landing page increases the trust factor - and conversions - with your market. Here’s a great example from AutoAnything. I searched for “brake calipers”. Their Google ad showed up as a side ad (which tends to have a 2-3% click-through rate). If you’re not using Facebook ads in your online marketing yet, you’re missing out. Facebook ads are some of the cheapest advertising options right now - the average cost per click is about $0.45 (yeah, that’s it). And you can target your market using all the massively rich personal data Facebook has on its 1.18 billion users. Facebook recently added ‘Automotive Targeting’ within its behavior targeting category. You can actually target your ads based on when someone last purchased a vehicle, the year and make of their vehicle, and the likelihood of someone buying specific auto parts soon. Demographics - You can reach your market by specific age, gender, relationship, education, job title and more. Interests - You’re able to reach your consumer based on interests, hobbies and Pages Liked on Facebook (for example, target to people who like car, truck or motorcycle Pages, or who have auto-related hobbies). Location - Like Google Ads, you can target to consumers where they live - based on country, state/province, and city. You can also target based on phone number and zip code - to reach repeat customers in your database. Advanced targeting methods include LookAlike and Website Custom Audiences. Some Facebook Ad providers make it super easy to create your ads. All you need to do is create your Headline, Ad Copy and Image. Then select your targeting (or let Wishpond choose your targeting options for you) and daily budget. Use eye-catching images - The image is what grabs attention on Facebook. Make your image match your ad campaign and landing page, and use an image that’s easy to recognize. Use action words in your Headline - The more you can instill a sense of urgent action, the more likely you’ll get immediate clicks. Be clear in your Headline and ad copy - Use the product name in your ad, show your USP and consumer benefits to leave no doubt that you’re the best place to get the product from. Check out How to Run a Facebook Ad that gets Clicks for more Facebook ad tips. Ad retargeting gives you a huge competitive advantage. Even with all your highly targeted marketing efforts, most people (like more than 95%) exit a site they’ve visited for the first time - without converting. They’re just not ready to buy from your immediately. Unlike a bricks and mortar purchase, an online buy doesn’t require the time and effort of physically going to your store, potentially meeting with your sales staff and then making the purchase. In an online environment, it’s easy for visitors to get distracted or just browse and shop around to your competitors. Imagine if there was a way to go and chase after that customer who just left your online store. Ad retargeting enables you to follow that bounced traffic. You not only get to remind your visitors to come on back to your store, you’re pretty much 100% guaranteed to reach your demographic with people who’ve already visited your site. Gives your website visitors a cookie. That cookie in their browser triggers your ad to show on websites that are part of the Google ad display Network (and there are literally millions of websites in the Network). You don’t have to guess where your potential customer is - your ad shows wherever they are. Being on sites your consumer visits (and trusts) tends to increase your own trust factor - and amplifies brand awareness through multiple touchpoints. Who doesn’t like getting a great deal on auto parts? As a business marketer, you know the power of giving away discounts and deals. Direct your prospects to a coupon landing page on your website. It’s actually pretty simple to technically setup up a coupon on your website (or Facebook Page and Twitter). Advanced tip: A really smart and savvy way to implement a retargeting campaign is with offers and coupons. You can chase your lost customers around and show how much you value their business by giving an exclusive online coupon. Once you’ve got a conversion or sale, you’ll have the email address of your customer. Use it, but don’t abuse it. A repeat customer is worth 3 to 7 times the cost of a new one. The better you can nurture your lead, the more likely they’ll buy your products - and keep coming back for more. An extremely cost effective way to initialize your relationships is with email marketing automation campaigns. Setup triggered email marketing automation campaigns to send a personalized “thank you” message with the customer’s name and product details. Keep the relationship going by sending out weekly updates (if they’re opted in to your newsletters). Send out deals and new auto products you’re getting in. It’s pretty simple to technically set up a triggered email marketing automation campaign. You can craft your first email and schedule to send it out, say 1 minute after the initial conversion. Then write and schedule more lead nurturing messages to be sent out over the next few days or weeks. An email marketing automation campaign gives you the opportunity to stay in touch with customers, and create a super personalized message. Check out more tips on creating sure-fire email subject lines. Or, more generally, check out how to optimize your email automation campaigns. Advanced tip: For auto stores with the resources and large enough customer base, I’d highly recommend segmenting your email database list. Customers buying parts for their Ford Fairlane aren’t interested in the same stuff as people needing a battery for their 2010 Mazda. Send out segmented, personalized emails to speak to your customers like you’d connect with them in your brick and mortar shop. Want to know a little known secret? One that’ll get you tons more leads? Yes, I know, they’re controversial - and they’re still relatively new to mainstream marketers. If you use them too much, they’ll backfire and you seem like a spammy company. But if you’re smart and you set up website pop-ups with your customer user experience in mind - you really can build your email list by a lot. Some of our customers using our pop-up toolhave increased email subscribers by 20% - in one month. Beat out your competitors and get a larger piece of the hot automotive parts market. Be one of the first to use website pop-ups in your sector. Check out a whole lot more about the ins and outs of setting up website pop-up campaigns. A well planned, comprehensive online sales funnel will increase brand awareness, generate warm leads and bring you more profits. Start with an optimized landing page, spread your message with online advertising and drive bounced traffic back with retargeting ads. Create incentives to convert and purchase with coupons. Follow-up to nurture your new prospects with well crafted email marketing automation campaigns. 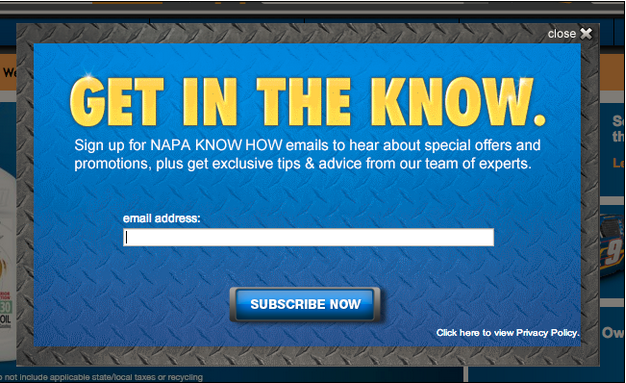 To really add fuel to your lead generation, incorporate pop-ups on your website. What do you think? Have you started an ecommerce site? How do you market your business online?